It’s a new year. And for many people, that means getting a whole new start on life. In many cases, achieving this new start involves making some changes. Growing up requires that we leave some things in the past while we take on new and exciting challenges. Sometimes, taking that next step in life requires the removal of a reminder of our younger days. Laser Tattoo Removal continues to grow in popularity, perhaps, because it helps individuals to move past previous mistakes. Not all tattoos are considered mistakes, of course. Many people still get them, loving the fashion, cultural or even political statements that they make. But so many people who have had tattoos for quite some time relate them to articles of clothing. Obviously, you don’t wear the same clothes forever. So why do some choose to inject permanent ink into their skin? It’s like putting on clothing that you can never take off. Styles change. Attitudes change. And yet your tattoo is there to stay. Laser Tattoo Removal helps people to take that next step in their lives. If you feel that a change needs to be made in your life and removing a now-unwanted tattoo will help you to do so, have no fear. The process is a safe and effective one. 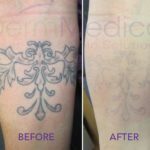 In a recently posted YouTube video on Laser Tattoo Removal(see below), it is explained how the Medlite Q-Switch Laser works to safely and permanently remove tattoos. The narrator reveals that photo acoustic energy is used to shatter the tattoo pigment into tiny fragments that the body is able to naturally dispose of. Incredible before and after shots are shown to demonstrate the effectiveness of the treatment. By looking at the after photos, you’d never know that a tattoo had been there to be begin with. Talk about starting over! Dr. Rebecca Small is shown in the video demonstrating how the Revlite system works in the removal of tattoos. Perhaps, what is most significant is how painless the procedure appears to be. The patient is shown to be sitting calmly and even indicates to Dr. Small that no pain is being endured. As she uses the laser on some dark, high ink-density section of the patient’s tattoo, it is easy to see how quick and effective the treatment is. Right in front of your eyes, the patient’s skin lightens due to the effects of the laser. The ink dissipates almost immediately, notes Dr. Small. She does admit, however, that the immediate lightening of the skin does not indicate that the tattoo has been automatically removed. Complete removal of most tattoos requires a number of sessions with the doctor. 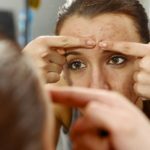 For more information on how you can start your new year off by removing a tattoo, contact DermMedica toll free at 1-866-861-3070, or if you are in Kelowna, call 250-868-3070.